So here is my next giveaway and I am happy to do it. 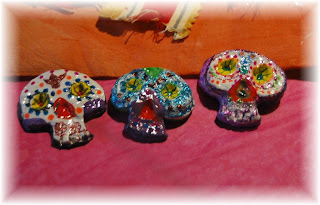 These were sculpted from polymer clay, then painted to reflect dia de los muertos!!! 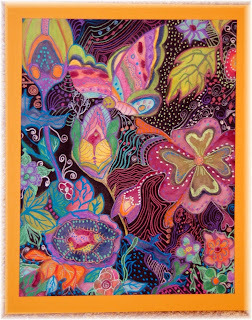 One of my favorite styles of folk art to make. And I would like to giveaway three of these to you. This will be up for two weeks and I will post another one again. These little skullies are either stick pins or magnets for your pc or whatever. Do you feel that global warming is a reality or do you feel that it is propaganda? (your answer will not affect your chances, so be honest please. I try to pick everyone at random so please done feel like I play favorites.. I appreciate you all and love connecting with everyone. Have a very creative week and show remember life is short, show people how much you love them! Yay!!! I love you all and so very much appreciate all the comments but I really appreciate those of you who took the time to follow me, I like to repay the follow by following you too and if for some reason I dont yet follow you.. Let me know ASAP. So here are the winners of my first giveaway. I will be posting the next giveaway later today!!! your all so wonderful and creative I thank you for all the inspiration!! Ok, so I am still a bit computer challenged but here they are cut and paste I guess, check out these blogs. Cool thing is that everyone is a little different so we can get something from each one. Sending you some crafty love and remember to love on those around you.! Inform me if I did something wrong K.
I am a mom and an artist and a wife. I love to create and share ideas and explore new mediums with others! "They like me, they really like me" !!!! Connecting with others through personal self expression with no judgments or preconceived expectations.